Flower bulbs and perennials appeal to people of all ages, for those with a green thumb, and those without! Almost everybody can find a spot in their yard, patio or balcony to enjoy our easy to grow flower bulbs and perennial plants. Great gift ideas for an upcoming special day or holiday! Bring a smile to people’s faces with the healthy choice of flowers in their home and garden. Profits Earned on Every Sale! As a fundraising organizer, you would recieve the product at a wholesaler price, enabling you to earn profits by selling the products at the retail price. Your customers can select from our special selection of bulbs and perennials. Florissa’s Fundraising Program offers FREE SHIPPING and FREE COLOUR BROCHURES! All adding up to guaranteed success with no risk to you or your group. Your Customers Will Be Blooming With Smiles! Your customers will be satisfied and delighted when they see their fantastic garden display, and will be looking to purchase and support your organization again. Offering a Spring and Fall program, we can provide you with two fundraisers per year, or supply you with your annual Spring or Fall program. Sell with confidence! Florissa only offers varieties that are easy to grow and are of top size and high quality. Our excellent quality will reflect positively on your organization. Provided for you are full colour promotional brochures, including an easy to read order form and insert (personalized for your group) for each of the participants. Groups generally choose approximately 2 weeks to run the fundraiser. Once selling efforts are complete, your fundraising coordinator will tally the orders and send in the Master Order/Payment Form with payment for your group order. Shipments are sent directly to you in time for planting in your specific region, or by a date you have selected. Please allow up to 2 weeks to process your order. Once your packages arrive, your group simply compiles each order and distributes them to customers for planting. Every package includes full colour picture and easy to follow planting instructions. A Proven Fundraiser with Community Participation! 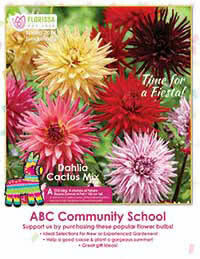 Year after year organizations such as school bands, choirs, eco groups, athletic programs, garden clubs, cadets, religious groups, children & youth groups and horticultural therapy programs have revealed that selling flower bulbs and perennial plants can be fun, profitable and a great way to beautify your community. Some of our fundraiser organizations enjoy helping their customers plant the bulbs and perennials once they arrive – what a great way to get involved with their customers after the sale, and an excellent project where kids and seniors can work together). Your efforts will be a “blooming” reminder to your community! Our staff will be glad to answer any questions you or your group may have about the “Create a Rainbow of Colour” Fundraiser Program. Contact our Fundraiser Coordinator today!